Old Cabell Hall is located at the south end of the historic Lawn, directly opposite the Rotunda. The Central Grounds Garage is located on 400 Emmet Street under the University Bookstore. It is open to everyone; parking charges apply. From the north: Follow 29 South through Charlottesville. As you pass Barracks Road Shopping Center, 29 South changes into Emmet Street. Follow Emmet Street through three lights. The fourth light will be at the intersection of Emmet and Ivy. The UVA tennis courts will be ahead of you on the left. Stay on Emmet through this intersection. After you pass Lewis Mountain Road on your right, the entrance to the parking garage will be on your left. From I-64: Take Exit 118B to Charlottesville and then take the next right hand exit (it comes up very quickly). At the end of the exit ramp, turn right onto Fontaine Avenue, towards Charlottesville. At the second light, go straight as Fontaine changes into Jefferson Park Avenue. Pass through a blinking yellow light. At the next stoplight, turn left onto Emmet Street. After you pass under two bridges, turn right into the parking garage. The C-1 lot is located off McCormick Road behind Clark and Bryan Halls. This lot is the closest parking for disabled and limited mobility patrons. Parking in the C1 parking lot is free for everyone after 6:00pm; however, on the evenings when the Tuesday Evening Concert Series and the Charlottesville Symphony at UVA are performing, only patrons who have obtained parking permits when purchasing season subscriptions may use this lot. From the north: Follow 29 South through Charlottesville. As you pass Barracks Road Shopping Center, 29 South changes names and becomes Emmet Street. Follow Emmet Street through three lights. The fourth light will be at the intersection of Emmet and Ivy. The UVA tennis courts will be ahead of you on the left. Stay on Emmet through this intersection. You will pass under a pedestrian overpass. Immediately after this, turn right onto the ramp leading up to McCormick Road. At the top of the ramp, turn left onto McCormick Road. Take the first right onto Cabell Drive, which is the entrance to the parking lot. From I-64: Take Exit 118B to Charlottesville and then take the next right exit (it comes up very quickly). At the end of the exit ramp, turn right onto Fontaine Avenue, towards Charlottesville. At the second light, go straight as Fontaine changes into Jefferson Park Avenue. Pass through a blinking yellow light. At the next stoplight, turn left onto Emmet Street. You will pass under a bridge; immediately after this, turn left onto the ramp leading up to McCormick Road. At the top of the ramp, turn left onto McCormick Road. Take the next right onto Cabell Drive, which is the entrance to the parking lot. Charlottesville Symphony: Permit information will be sent to subscribers. Contact Brian Simalchik, 924-3139. Tuesday Evening Concert Series: Permit information will be sent to subscribers. Contact Karen Pellón, 244-9505. Charlottesville Chamber Music Festival: Permit information will be sent to subscribers. Contact Chamber Music Festival administrator 295-5395. Starting from the C-1 Parking Lot parking lot behind Bryan Hall and beside New Cabell. Enter New Cabell Hall on the parking lot level. Take the ramp or the stairs to the 2nd floor hallway. Cross the hallway and exit New Cabell through the door into the courtyard directly in front of you. Take the ramp to Old Cabell Hall. Upon exiting the elevator you will turn right to reach the lobby or left to go to the handicapped box. Starting from the C-1 Parking Lot behind Bryan Hall and beside New Cabell. 2. Turn left at the end of the hall. Elevator is on your left. 8. Take the ramp on your right into Old Cabell Hall. Parking near Scott Stadium is free and open to the public after 5 pm and on the weekends. University Transit Service runs buses through these lots with stops near Thornton Hall and the Elson Student Health Center. Map of UTS bus routes. From the north: Follow 29 South through Charlottesville. As you pass Barracks Road Shopping Center, 29 South changes into Emmet Street. Follow Emmet Street through three lights. The fourth light will be at the intersection of Emmet and Ivy. The U.Va. tennis courts will be ahead of you on the left. Stay on Emmet through this intersection. You will pass under two bridges. Immediately after the second bridge, veer right onto Stadium Road while Emmet curves to the left. At the top of the hill, turn right onto Whitehead Road. The parking lot will be on your left. From I-64: Take Exit 118B to Charlottesville and then take the next right exit (it comes up very quickly). Turn off this exit towards Charlottesville. This will put you on Fontaine Avenue. At the second light, turn left onto Maury Ave. At the four-way stop sign, turn right onto Stadium Road. Turn left onto Whitehead Road, and the parking lot will be on your left. Parking Lots on "the Corner"
There are several pay parking lots along University Avenue that will enable you to easily catch a bite at one of the many restaurants on the corner before strolling down the Lawn for a concert. The Corner Parking Lot is located behind the College Inn and Elliewood Parking Lot is a covered garage on Elliewood Avenue. There is also a small parking lot on Chancellor Street. All of these are pay parking lots. Garrett Hall / Amphitheatre Stop: The closest bus stop to Old Cabell Hall is at Garrett Hall / U.Va. Amphitheater. This stop is serviced by the Charlottesville Transit Service (CTS) Free Trolley and the following lines of the University Transit Service: University Loop, Northline, and Central Grounds. Cabell Hall Stop: Just outside New Cabell Hall is a bus stop on Jefferson Park Avenue. This stop is serviced by the Charlottesville Transit Service (CTS) Free Trolley and Route 4B (4b runs only in the daytime). University Transit Service routes that stop at Cabell Hall include: University Loop, Green Route, and Stadium Route. 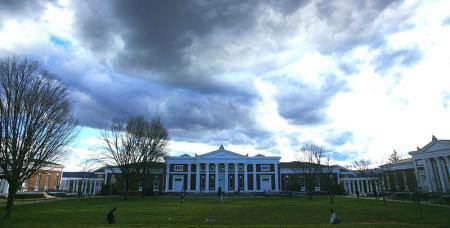 Rotunda Stop: Old Cabell Hall is just a short walk down the historic lawn from the Rotunda stop. The Rotunda stop is serviced by the Charlottesville Transit Service (CTS) Route #7. Old Cabell Hall also has handicapped access from the Lawn via a ramp into the west entrance of the lobby. Once entering the lobby, proceed to the right through a double doorway and take an immediate left, which leads to the Handicap Box in the Concert Hall. Alternatively, entering from the C-1 parking lot, come up from the lot behind Bryan Hall. Follow the blue handicap signs into New Cabell Hall and up the ramp or the wheelchair lift. Cross the hallway and exit New Cabell through the door to the courtyard. From the courtyard, take the ramp to the end. Enter the door to Old Cabell Hall on the left and take the elevator up to the 6th floor. The Arts Box Office is open from noon until 5 pm, Monday through Friday at the Culbreth Theatre building. During the day, free parking is available along Culbreth Road in the cutout directly in front of the Drama Building. Please note that the Culbreth Road Garage is gated and only accessible to A9 parking permit holders from 6am to 4:30pm, Monday through Friday. The parking garage is open to everyone after 4:30 pm and on weekends. On the night of an event the Arts Box Office will move to Old Cabell Hall. They will start selling tickets in Old Cabell Hall one hour before the event. If you wish to attempt to purchase tickets on the night of an event there are two temporary parking spaces (15 minutes) for the purchase of tickets. From University Ave/Main St. turn onto McCormick Rd. About 1 block down, you will see slice gates in front of you. Just before you reach these gates, there is a sign reading "Garrett Hall" on your left. Turn 90 degrees to your left just before this sign and follow the narrow McGuffey Drive to the end. Here you will see a sign for Cabell Hall Box Office Parking. Park and proceed down to Old Cabell Hall at the south end of the Lawn. Please move your car after your tickets have been purchased.